© 2010 theCrackerBoxKitchen. All rights reserved. T and I have been on vacation this week. The first half of the week we lounged on the beach, our toes in the sand, drinking White Russians (“Caucasians” to all you Lebowski fans.) The latter half we’ve spent lounging on the couch, eating Krispy Kreme doughnuts, (drinking more White Russians), and watching movies. Being the thrifty vacationers that we are, we not only stayed at the beach for free (! ), we also saved money by cooking our own meals and eating in. I tweaked the salad dressing and ” accoutrement” to better suit our tastes. Quite frankly, the “vinaigrette” (which didn’t even have vinegar in it!) that was listed with the recipe was disgusting. I whipped-up a fresh ginger and honey vinaigrette that was perfectly paired with the meat. T was practically licking the glaze out of the pan and trying to figure out what else we could put it on. Spread on banana bread? Drizzled over fruit and yogurt? Mixed with the White Russians? Preheat oven to 350°F. Stir together salt, pepper, cumin, chili powder, and cinnamon. Coat both sides of pork with rub. Heat olive oil in a cast-iron frying pan (or heavy ovenproof skillet) over moderately high heat until it just begins to smoke. Brown pork, turning after 2 minutes, for about 4 minutes total. Leave pork in skillet. Stir together brown sugar, garlic, and Tabasco and pat onto top of tenderloin. Place skillet on center rack of oven for approximately 20 minutes. Pork is cooked when small slice shows a white center and juices run clear. Remove from oven and let pork rest in skillet for 10 minutes. While the pork is roasting, vigorously shake together ginger, honey, lemon juice, vinegar, and oil in a lidded glass jar. Cut pork at a 45-degree angle into 1/2-inch-thick slices. Using tongs, divvy out salad mix onto plates. 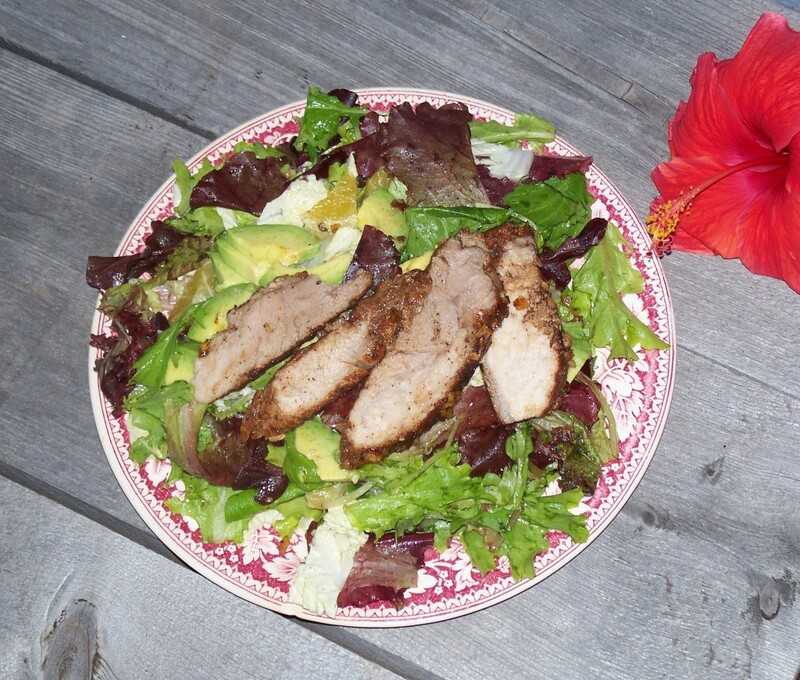 Place sliced pork and avocado on top of greens and serve! *WaaaaHOOOOO!!! * I am the proud new owner of a 5-quart, “Metallic Crome” KitchenAide Artisan Series stand mixer!!! This postcard was on PostSecret a few weeks ago.